Melt Candiquik (or other vanilla candy coating) in microwave according to package directions. Stir in 3 tsp cinnamon until blended. 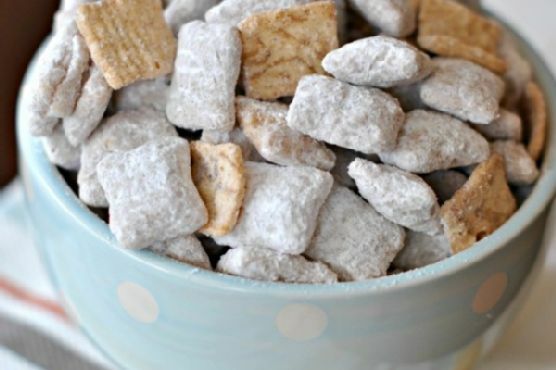 In a large mixing bowl, combine Rice Chex cereal with melted candiquik. Stir until coated completely. In a large gallon size ziploc bag, add powdered sugar with remaining 1 tsp cinnamon. Close bag and shake to combine. Add vanilla coated cereal mix to bag, zip closed and shake! Make sure all the cereal has been covered. Add Cinnamon Toast Crunch cereal. Store in airtight container for up to one week. ENJOY. Snickerdoodle works really well with Cream Sherry, Madeira, and Prosecco. Sweet bubbly Prosecco doesn't overwhelm simple sugar or shortbread cookies, a sweet cream sherry complements spiced cookies, and madeira's nutty notes match cookies with nuts perfectly.